Vigils have been held across the island of Ireland for Sinn Féin’s Martin McGuinness, who has died aged 66. His body was returned to his Derry home on Tuesday afternoon. Hundreds of people accompanied the coffin, draped with an Irish tricolour, as it was carried through the Bogside area. The ex-IRA leader turned politician died in Altnagelvin Hospital overnight aged 66. It is understood he had been suffering from a rare heart condition. His death prompted the Northern Ireland Assembly to be recalled on Wednesday. The funeral will be in Londonderry on Thursday. Vigils took place in Northern Ireland and in the Republic of Ireland on Tuesday night to mark the former deputy first minister’s death. One, on the Andersonstown Road in west Belfast, attracted hundreds of people. It took place on the site of the former Andersonstown Road police station. Some of those gathered were holding candles and sang songs while others watched on. Father Gary Donegan offered prayers and told the crowd how he had “anointed and blessed” Mr McGuinness “weeks ago”. 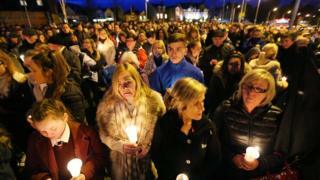 Another vigil was held near the General Post Office headquarters in Dublin city centre, in the Republic of Ireland. Similar events were held in Galway, in the Republic of Ireland, and Dungiven in County Londonderry. The flag above Leinster House, which houses the Irish parliament, will be flown at half mast on the day of Mr McGuinness’ funeral. Politicians and others have been giving their reaction to Mr McGuinness’ death, as have those who lost loved ones or were injured in the IRA campaign. Colin Parry, whose 12-year-old son, Tim, died in an IRA bomb in Warrington in 1993, said that although he did not forgive the IRA or Martin McGuinness, he found him a man who was “sincere in his desire for peace”. Mr McGuinness became deputy first minister in 2007, standing alongside Democratic Unionist Party leaders Ian Paisley, Peter Robinson and Arlene Foster. Former Conservative cabinet minister Lord Tebbit, who was injured and whose wife was paralysed by an IRA bomb in Brighton’s Grand Hotel in 1984, described Mr McGuinness as “a coward”. “The reason he suddenly became a man of peace, was that he was desperately afraid that he was going to be arrested and charged with a number of murders,” he said. Taoiseach (Irish prime minister) Enda Kenny said Mr McGuinness’ death represented a “significant loss, not only to politics in Northern Ireland, but to the wider political landscape on this island and beyond”. Mr Kenny will attend Mr Guinness’ funeral as will Irish President Michael D Higgins. Born in 1950, Martin McGuinness grew up in Derry’s Bogside, radicalised, he said, by discrimination and murder on the streets of his city. The shift to politics came slowly: Mr McGuinness was chief negotiator in the blossoming peace process and took on the post of education minister. His funeral cortege will leave his home on Thursday at 13:20 GMT ahead of Requiem Mass at St Columba’s Church Longtower at 14:00. He will be buried in the City Cemetery.